You are here: Home / Den Talk / Calling all aspiring football writers! BCLionsDen.ca wants you! Calling all aspiring football writers! BCLionsDen.ca wants you! Are you an aspiring journalism student? Are you longing for a career as a sports reporter? 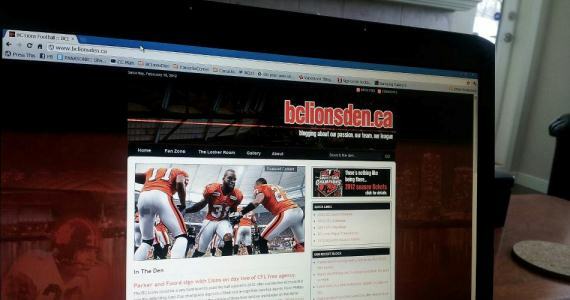 The original BC Lions fan blog, BCLionsDen.ca, would like to find some talented and passionate CFL and BC Lions fans to write for the site leading up to and during the upcoming 2012 season. Joining our team will give you exposure as a writer and build your resume as a sports writer. As we have grown over the years, so has the exposure to the site. We’ve written Grey Cup pieces for the Vancouver Province, post game thoughts for The Province online, and contributed articles for BCLions.com and CFL.ca. The site is respected by the league, the club and it’s players as a promoter of the game, and as a site that treats people fairly and with respect. If you have what it takes to be a sports writer, we would love for you to join our team. Grade 12 education or better and preferably enrolled in a post secondary journalism program. Exceptional attention to detail, spelling, grammar and punctuation. Talent with video production and editing would be an asset. Willing to contribute at least 1 article a month for the site during the season. Strong understanding of social media. Strong knowledge and passion about the Canadian Football League and the BC Lions. You agree to maintain the vision and reputation of the site. This is a non-paid position but one that will give you exposure for your work and help you build a portfolio. Or, you can just do it for the love of the game like we do!